From September 14 to 17, more than 140 Anglicans met at an institute named “Carreac” near Lake Hamana to on the occasion of the 2012 Mission Conference of NSKK (Anglican Communion in Japan). The participants include all the bishops of NSKK, the representatives of the dioceses, and members of the provincial committees, as well as the delegates of Anglican Church of Korea. (3)To be used as a permanent instrument of peace, on the basis of the resolution adopted by the 49th General Synod, 1996, of the NSKK, in which it officially apologized to the Asian peoples for Japan’s war responsibility against the Asian nations, at a time when continued conflicts are raging in many parts of the world over political, religious, national and racial issues. The Great Earthquake and Tsunami, as well as the concurrent nuclear disaster at Fukushima 1st Nuclear Power Plant, which occurred on March 11, 2011, did too serious a damage to all living creature there. Various problems raised by the disastrous incidents put radical questions to the way we have lived and the churches have existed so far. We can no more consider the concrete matters about the mission and church without reference to the real situation brought about by the disaster. It is in this context that the Mission Conference took place. We shared plenty of time, learning and talking about the mission of the church and the problems of supporting our ecclesiastical bodies. The lecture titled “Walking on Jesus’ road – an unprecedented challenge to stop nuclear power generation in favor of the future generations,” delivered by Sr. Yasuko Shimizu, a Catholic nun from Mercedarias Missioneras de Berrize, challenged us to consider the way we should live in the serious situation of radioactive contamination by the nuclear disaster at Fukushima Nuclear Power Plant. The Rev. Kiyozumi Hasegawa from the “Let Us Walk Together! Project” of NSKK, a project to support those people suffering from the results of the earthquake, tsunami and nuclear disaster in Eastern Japan, dwelled on the mission of the church, referring to his own experience of encountering the Lord Jesus who stood by the suffering people. The Rev. Kenzo Koshiyama, also from the “Let Us Walk Together! Project,” talked about the reality and agony of life in the area contaminated by radiation, as well as the distress and dilemma in which ministers and churches are placed. The Rev. Renta Nishihara delivered a keynote lecture titled “For a vision of our own mission – the tasks and possibilities of NSKK’s mission,” in which he presented a variety of missionary visions based on plenty of resources and materials. The bible sharing, “Who are we, and what are we requested to do? – The response to the question in relation to God,” led by the Rev. Tazu Sasamori, challenged the participants to think of the mission of human beings as a creature. Learning from the above lectures and presentations, we were divided into 15 groups to discuss the future vision of ecclesiastical missions. On the basis of the topics and subjects discussed by those groups, we advance the following statement in the hope that NSKK will renew itself as a community determined to defend all the God-created life. In the mission conference, we realized anew that the origin of NSKK’s mission is the careful and sincere pastoral work for the whole area in which the church is placed, not to speak of the pastoral care within the church. It is also to sincerely deal with the problems in the area and the world. The lessons we learned from “Let Us Walk Together! Project” include the importance of listening to the feeble voices of those people in despair in this world and society filled with tragedies, to become the voice of voiceless people, and, in spite of the distress and hopelessness, to continuously proclaim the joy of life blessed by God to the people deprived of all hopes, even if the voice is feeble and prayer is small. We humbly reflect on our own past in order for NSKK to take steps toward a newborn community of faith, in the hope and faith in God. We pray together with a deeper appreciation of the Word and Worship to express the salvation and joy brought about by Christ and to invite many people to the grace of God given through the sacrament. Our church gives its heart particularly to those people who want cure and liberation, treasures the life of everybody, and hopes to participate in the Lord’s salvation together with its parishes and all creatures. We name the coming decade “Decade of Mission and Pastoral Care of NSKK” and propose that, during the decade, all the members, lay and ordained, congregations and dioceses should be spiritually united in totally dedicating themselves to the mission and pastoral care in the following fields in their respective contexts and forms. We set up an organization intended for the promotion of ecclesiastical efforts to build a new community cooperating each other. The provincial standing committee and the appropriate diocesan bodies are committed to decide as to what kind of organization will be necessary. We propose that the next conference, “2022 Mission Conference of NSKK,” should be convened in ten years to share the results of mission and pastoral care during the coming decade. The conference will be a thanksgiving festival to harvest the fruit of our onward mission and pastoral care. We propose the following subjects according to the five elements of the church, which Anglican Communion have long cherished – kerygma, deaconia, martyria, leiturgia, and koinonia. ◇We always listen to the Word, our Lord, who is the creator of all life, the restorer of the dignity of all life, and the leader of all life. ◇We create a wider variety of ministry, including lay readers, catechists, local ministers, etc. in order for church members, lay and ordained, to dedicate themselves to “careful and sincere mission and pastoral care.” For this purpose, we set up necessary educational programs at various levels. ◇The province and dioceses should take a new look at the theological education at the seminaries, to nurture ordained ministers and theological educators. ◇To clarify the tasks to be dealt with by each parish by laying the story of “encountering the Lord Jesus who stands by the suffering people” through the testimonies on the sites of Great Earthquake and Tsunami in Eastern Japan on the story of the Bible. ◇We protect the life of the earth by living in harmony with nature. ◇We should be brave enough to reveal the social contradictions and conflicts by saying flat “No” to the society in which priority is given to other things than life, in step with those people in difficult situations. 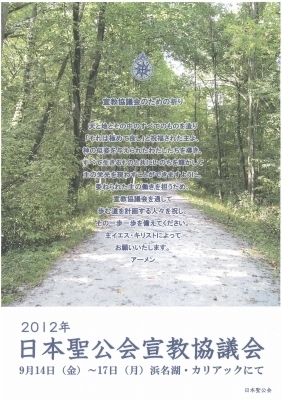 ◇We realize the problem contained in having said “the prayer for the oblation of nuclear reactor” on occasion of the opening of the Nuclear Energy Institute at Rikkyo (St. Paul’s) University in 1962. We pursue and put into practice the content of “For a World Without Nuclear Power Plants - The Anglican/Episcopal Church in Japan Opposed to Nuclear Power Generation,” a statement adopted by the General Synod of NSKK in 2012. ◇We continue to stand by, pray for, and walk together with the people suffering from the results of the disaster in Eastern Japan. As the “Let Us Walk Together! Project” abode by its Mission Statement in an effort to pay respect to the suffering people, we hope to cherish the bonds with the disaster-hit areas even after May 2013 when the Project will come to an end. ◇We will collaborate with the institutions which were created as ministries of the church, with a fresh realization that they are part of the church’s mission. ◇We reconfirm that the variety of churches in many places are in themselves the Gospel and Mission. ◇We should be courageous enough to radically change the way churches have existed (customs and polity) while paying respect to the tradition. ◇We convey the joy of the faithful life in words and ways intelligible to all people. ◇We will study a wide variety of liturgy and service formulae on the basis of the dignity of all life. ◇We will study the time and day for liturgies, make a database of services, create a variety of service formulae with plenty of alternatives, and study various liturgical music, in an effort to meet the needs of people in different situations. ◇While making our common services richer, we encourage ourselves to grow spiritually through our own individual prayers. ◇We build churches which will serve as a comfortable place of stay and encounter for all people. ◇We create a communion in which we walk together with each individual person, respecting the dignity of individual life and positively encountering people, without simply grouping them as “aged”, “youth”, “female”, “male”, “children”, “disabled”, “foreigners”. ◇We build a community in which no harassment is allowed, while securing the equality between genders, in order for each of us to work together as Christian ministers under the equal partnership. ◇We listen to the voices of young people, and respect and support their independent activities. ◇Fair representation in the decision-making bodies at parochial, diocesan and provincial levels is necessary in order to build churches serving the world. As a first step, we raise the presentation of women up to at least 30 percent by 2022, as well as encourage the representation of younger generation. ◇As a community of faith, we commit ourselves to the Christian ministry, aware that every one of us should work as a minister in and out of the church, rejecting any sacerdotal or layperson-first attitude. ◇We go beyond the boundaries of individual church and diocese to share the gift of each other. We also create concrete opportunities to meet each other to work for the cooperation and reorganization of dioceses. ◇We exchange information with, learn from, and cooperate with all congregations of Anglican Communion. ◇We promote the cooperation with the Anglican Churches in Asia, including the Anglican Church of Korea and the Episcopal Church in the Philippines. For this purpose, we substantiate the Declaration on Our War Responsibility, adopted by the General Synod in 1996, in more specific terms.